After years of working in the sizeable shadow of Bajaj Auto, Rahul Bajaj’s younger son Sanjiv strides out on his own into the high-growth world of financial services. 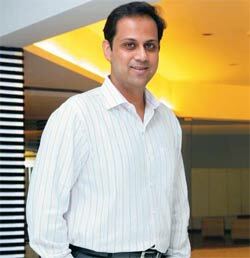 To say that the past year has been one of definitive change for Sanjiv Bajaj would be an understatement. Consider: The 38-year-old younger son of Rahul Bajaj who had studied mechanical engineering and manufacturing, headed straight for the shop floor of the twowheeler major with the notion that he would be spending most of his life amidst scooters and motorcycles. And, till recently, that pretty much was how life was—as a Director at Bajaj Auto, Sanjiv headed the finance function and later took on the mandate of growing the international business. At the sprawling headquarters of Bajaj Auto in Akurdi in Pune, life was unhurried. Home was just a few metres away from office, the likes of Bruce Springsteen and Pink Floyd were constant companions, and time hummed along smoothly, pretty much like an engine on the best-selling motorcycle, Bajaj Pulsar. It’s been quite a journey for the younger Bajaj. Then, one fine day last year life took a turn. A chance meeting with yoga guru Baba Ramdev introduced Sanjiv to the world of his inner body. Result? Every morning he practices breathing exercises that help him control the bio-energy residing in his body. “I find much more energy in me at the end of the day than what I used to have before,” beams Sanjiv. The lanky, one-time national-level basketball player has no time for the game now. Reason? You only end up hurting yourself. “It’s a rough game. You go out of action for days if you get hurt. As you get older you cannot keep going through that.” The effect of yoga—along with visits to the gym—is evident. Today, Sanjiv is lean and trim, having shed the extra kilos he had gained in the recent years. The new phase isn’t restricted just to Sanjiv’s lifestyle. At a professional level too, there have been some big changes; the biggest of them is a move out of the backroom of Bajaj Auto onto the centre stage of a completely different portfolio of businesses. When Bajaj Auto was finally demerged into three separate companies three months ago, Sanjiv took control of the fastgrowing financial services pie (elder brother Rajiv runs the automobiles company). The transition from manufacturing to financial services has been remarkably seamless for Sanjiv (perhaps helped by the fact that he was in charge of the finance function at Bajaj Auto). So, these days he’s as comfortable and passionate talking about—in his familiar baritone voice—insurance under-penetration and the relative under-leverage of Indians as he was talking about taking Bajaj’s motorbikes into South East Asian markets and China a few years ago. “There is a huge opportunity at our doorstep,” says Sanjiv. As Managing Director of Bajaj FinServ Limited, the holding company for the financial services business, Sanjiv sits on a cash pile of Rs 700 crore. “We also have the option to draw money from Bajaj Holdings & Investment or to raise debt in Bajaj FinServ,” says Kevin D’sa, President at Bajaj FinServ. Whilst Bajaj FinServ as a standalone company (with a wind power business, amongst others) is making profits, the consolidated operation, including insurance, is in the red; Sanjiv hopes to enter the black in the next 2-4 years. The losses on the books are hardly a concern for Sanjiv, as his focus today is squarely on growth. Sanjiv’s goal is simple. And ambitious. He wants to position Bajaj FinServ as a financial powerhouse, on the lines of an ICICI or an HDFC. The three pillars of this powerhouse are: Investment, Lending, and Protection. The missing link today is clearly Investment. Bajaj has a presence in lending via Bajaj Finance, which finances consumer durables and personal computers. The protection part is taken care of via the life insurance and general insurance companies, both joint ventures with Allianz of Germany. Sanjiv now wants to plug the gap on the investment front. The success of the Bajaj-Allianz combo in mutual fund-styled ‘unit-linked insurance products’ has encouraged Sanjiv to look at asset management. He is talking to a few players (Allianz is one of them). “We are also looking at going it alone,” reveals the Managing Director. Sanjiv reckons he can make up for the late-mover disadvantage with the help of two intrinsic strengths of the Bajaj group: One, the widespread distributor network of the insurance subsidiaries; and two, the household brand that is Bajaj.